ssued a few weeks before Syriza’s historic election victory (which may eventually lead to the infliction of further collective punishment on the mass of the Greek population), YΔΩP (the ancient Greek for water) is a timely release. Based in Berlin and the Greek island of Lesbos, Alcalica write lyrics in five languages and draw from various cultures, rooted in Greek and European culture but drawing wider influences such as Persian instrumentation, electro and jungle. Other sources cited include Greek “Rembetiko of the interwar period and the enchanting melodies of the Aegean”. Fortunately, although it has one or two awkward and slightly comic moments, YΔΩP more or less avoids cringe-making and ham-fisted Cardew-isms, offering an intriguing and atmospheric view of the state of Europe and the world through cosmopolitan Greek eyes. “Europe is a CRUMBLING old lady who can’t look at her eyes in the mirror, ignores the pre-revolutionary exponential rays and the pressure rises”. The lyrics switch languages, from English to Greek to German and the vocal delivery is slightly camp and sneering. It’s a powerful and effective statement, although it would be more correct to say that Europe is a battered old lady under constant assault from within and without. The graceful and melancholy Greek atmosphere that opens ‘mraw’ is soon enhanced by warm bass pressure and sparse beats. 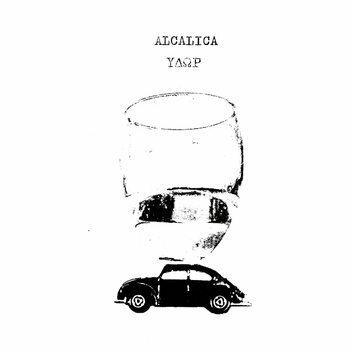 Alcalica’s “industrial world music” is both melancholic and uplifting, tragic and hopeful. The bleak and uncanny opening section of ‘ydwr’ (water) shifts interestingly into a curious lament with faux-naive vocals that again have an odd 1980s quality to them “all the world will have access to clean water”. Foghorn-like bass and dubstep-like details contrast the child-like vocal line. ‘Fear’ is a more militant, bass-heavy track that seems strongly influenced by dub reggae and jungle. The chorus line “emotions can provoke a great agitation, a chemical release that changes reality” is sung both plaintively and resolutely. Listing the ills of the world with this distinctive mix of instrumentation is a curious strategy that somehow works. Initially musically softer and even playful, ‘Gladio’ unexpectedly confronts the infamous NATO “stay behind” organisation deeply implicated in past and present right-wing terrorism and black propaganda operations in Europe, not least in Greece itself, which only left formal military rule 40 years ago. Once the violins cut in, accompanied by breakbeats, the track assumes a more urgent, Balkan atmosphere. With neo-Nazis active within the police and security structures in their Greek homeland, addressing this massively under-discussed subject is a brave and worthwhile stance. In a timely coincidence, the release appeared in the same month as a major article on Britain’s mendacious support for Greek Nazi collaborators in the 1940s, the effects of which are still felt today. Alexei Monroe. From Speak and Spell to Laibach.